A lot of great things happened in 2018, but one of my most important through lines of this past year was Edo Bayashi. My initial introduction to traditional Tokyo festival music happened through my first teacher, Saburo Mochizuki sensei, who patiently taught these intricate rhythms to me and the members of our youth taiko ensemble based in Saitama. I can clearly recall those lessons and eventual performances where I quickly realized the necessity to practice the material on my own time in order to internalize it completely. This was quite different than the other taiko pieces we had been learning. The music was fascinating, but I also remember the unmistakable festive feeling of omatsuri bringing joy every time I heard this music. Many years later, I had the good fortune of completing a full circle by studying and performing Edo Bayashi in Hawaii with Kenny Endo. In addition to studying Japanese classical percussion with Saburo sensei, Kenny had spent many years learning Edo Bayashi from Maru sensei, one Wakayama Shachu’s top players. During my time as a member of Kenny’s ensemble, I met Suzuki sensei. He had been invited by Kenny to appear as a guest artist for a Hawaii concert tour, and I was immediately struck by his combination of uncompromising artistic standard and genuine niceness as a teacher and fellow musician. This first encounter has turned into a thirteen-year connection spanning lessons, concerts, and US tours, and I am grateful to have Suzuki sensei as a teacher, collaborator, and friend. Below are some of the highlights of my Edo Bayashi year of 2018. For anyone wanting to start or to further your Edo Bayashi studies, contact me. I’m happy to answer any questions and help you gather the necessary tools to start practicing. This music is remarkable in the way it has been steadily spreading across players of all styles, ages, and experience levels. In addition to workshops, I teach private lessons - both in person and through online software like skype. Feel free to send me an email to inquire about setting something up for yourself or your group. I can also discuss possibilities of inviting Suzuki sensei to your area. In order to further my Edo Bayashi study, I traveled to Tokyo for a 2-week private lesson intensive with Suzuki sensei in June. While my previous intensive focused on how to teach the kihon (basic) version of Edo Bayashi, this recent trip was to focus on how to teach the next level. Learning “Level 2” has its challenges due to the music being more free and open to changing rhythms and section lengths compared to the “Book” version. I wanted to make sure my own playing and instruction concept reflected the proper approach of Suzuki sensei within the Wakayama-Ryu style. Our lessons covered three main topics: the music (shimedaiko, odaiko, atarigane, shinobue), the reigi (etiquette), and shimedaiko tightening. There are various paths of study that Level 2 Edo Bayashi can take, but it was important for me to clarify all of the details so that my teaching of the material would be completely in line with Suzuki sensei’s method. It was also interesting to confirm my thinking that, like the study of jazz, transcribing and studying the best players are of paramount importance in this next-level study. 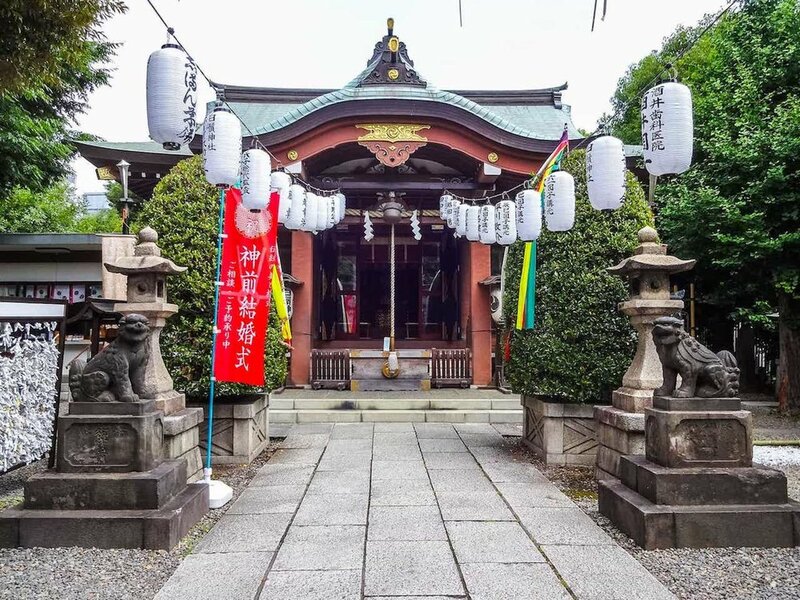 On this trip, I was lucky to have the opportunity see Wakayama Shachu perform Edo Bayashi several times at a small festival in Tokyo at Shirahige Jinja, and this provided more insight on how Suzuki sensei and his fellow members approach this music. Aisatsu - this is to acknowledge the presence of your teacher and fellow students. Always say hello when you see someone for the first time, especially your teacher. The phrase “yoroshiku onegai shimasu” can be added after the initial hello if a lesson, rehearsal, or performance is to follow. It’s also important to say goodbye before parting. A simultaneous lowering of the head, even slightly, communicates your feeling of respect to the person. It’s also good practice to avoid looking down on your teacher by positioning yourself at the same level or lower than your teacher. For example, sit down if they are seated, or step down from a higher point such as a riser on stage. Arigato gozaimashita - thanking your teacher for a lesson, performance, meals, and generally their time and energy can probably never be overdone. A truly great teacher provides us with invaluable knowledge and experiences, so the least we can do is to express our appreciation as much as possible. This also applies to the next day or next meeting after a lesson, concert, or meal where we can say “thank you for the performance yesterday.” Notably missing here is “otsukare samadeshita” because within Wakayama Shachu, as is the case in many Japanese traditional arts, this phrase is never used to address your teacher or fellow students who are more experienced. Ayamaru - as sensei says, we apologize to clear the air. If we make a mistake during a performance, good etiquette tells us to say sorry to your teacher (and fellow performers) immediately after exiting the stage. This is to verbally clarify that you take responsibility and do not place blame on others. Common sense also dictates us to apologize for being late, or causing nuisance in any way to your teacher. Of course, we should always be striving to prevent situations where such apologies become a necessity in the first place. Finally, I was able to learn the shimedaiko tightening method used by Wakayama Shachu. It utilizes the agebachi as well as a large wooden mallet, which provides leverage so that getting a lot of rope tension is possible without much muscle exertion due to physics and the use of body weight. In contrast, the two-person tightening method requires more strength along with the biggest disadvantage of needing two people. The other common method of pulling up on the rope as you stand on top of the drum also requires more muscle power, and it strains your back even if you are careful to use your legs. I am confident that the method Suzuki sensei taught me is truly superior to these other two, and I’m looking forward to sharing the technique with others in the near future. The taiko world needs more properly tightened shimedaiko, in my opinion. I would like to express my enormous gratitude to Yoshihiko Miyamoto and Miyamoto Unosuke Shoten for sponsoring these private lessons. Such kind support is very important and meaningful for me to continue my studies into this bottomless well of learning that is traditional Tokyo festival music. Thank you very much Yoshi san! Ho Etsu Taiko invited Suzuki sensei for a 1-week residency which included many hours of workshops and private lessons along with the group’s very first performance of Edo Bayashi. The planning started 6 months before the concert, when I conducted an introductory Edo Bayashi workshop weekend for Ho Etsu. This extraordinarily short timeline required focused planning and a lot of hard work, and the group’s dedication came through in multiple ways, resulting in a very successful residency and concert. This was their first time meeting Suzuki sensei and I could sense a bit of anxiousness as his arrival date approached, but it didn’t take long for everyone to witness his kind and relaxed demeanor. The concert program was a nice mixture of Ho Etsu’s repertoire, featured spots for Suzuki sensei and myself, and the traditional forms of Edo Bayashi, Edo Kotobuki Jishi, and Ryoumen Odori. The members of Ho Etsu created an excellent blog series documenting this process, and they even asked me to contribute a guest blog. Ho Etsu’s leader Jason Matsumoto also created a short video recap of the residency, which provides a glimpse into the activities that week. The planning of this US tour began with TaikoArts Midwest’s Jennifer Weir and Iris Shiraishi inviting Suzuki sensei for their April installment of Taiko Tuesdays concert series. We were in Minnesota for ten days, which consisted of rehearsals, workshops, private lessons, and a little bit of sightseeing. Suzuki sensei continues to be impressed with the progress of the TAM Edo Bayashi Ensemble. He was there in August 2017 to work with the group and some of the members have taken other intensives in the US and Tokyo. Like Chicago, the concert included pieces from the Enso Daiko repertoire, features for Suzuki sensei and myself, and the traditional forms of Edo Bayashi, Edo Kotobuki Jishi, and Ryoumen Odori. Perhaps the most significant achievement is this: this was the very first performance of Level 2 Wakayama-Ryu Edo Bayashi as taught by Suzuki sensei outside of Japan. As important as this was, TAM continued to blaze trails a few months later by crowdfunding successfully to purchase a new set of instruments for Edo Bayashi and Kotobuki Jishi from Miyamoto Unosuke Shoten. More about these drums later, but a big congratulations to the TAM Edo Bayashi Ensemble! Our final stop was the Kaoru Watanabe Taiko Center in Brooklyn, New York for a weekend intensive. The format consisted of instruction on Friday, Saturday, and Sunday as well as facilitating in-depth learning along with ample opportunities to talk and ask questions to sensei during breaks and communal mealtimes. Being at the end of a long and busy tour, Suzuki sensei and I were somewhat challenged by this intense schedule, but it was very rewarding to spend so many consecutive hours on instruction and informal conversation. One of the fun late-evening moments was when Kaoru hooked up his computer to the projector and we watched various videos of Suzuki sensei and Wakayama Shachu, pausing to talk about the music, dance, costumes, history, or some related topic. It’s a pleasure to have a friend and colleague like Kaoru, as our views about the importance of traditional forms, and music in general, are very much in line with each other. In March, I interviewed Kenny Endo for my blog’s interview series. I wanted to specifically talk about his time in Japan learning Wakayama-Ryu Edo Bayashi, and this interview turned out to be an important resource for anyone interested in Edo Bayashi. I agree with Iris Shiraishi who said there were many ‘aha’ moments during the conversation. Thank you to Kenny for making time to share these important stories and insights. Earlier that month, I was invited for a weekend of public workshops in San Diego. I had spent a week there in August 2017 during the North American Taiko Conference and Suzuki sensei’s Shishi Mai Summer Taiko Institute. Partly due to this, there was plenty of interest in workshops for Edo Bayashi and the shishimai ohayashi (music). I also offered workshops for shinobue and taiko fundamentals to round out the weekend. I had a great time and it was wonderful to see so much interest in these topics. My hosts were wonderful, taking me around to visit a respectable number of breweries in the thriving scene there. Thank you to Chris Huynh and Jack Hsiao for the warm hospitality. Later that month, I was invited by Susan Yuen of Jun Daiko to work with the Edo Bayashi nerd club in Mountain View, California. Jun Daiko has so many members with whom I played in Hawaii as a member of Kenny’s group so it’s always a fun reunion where we can speak the same language and share stories. You can also read Sue’s guest entry at Ho Etsu’s Edo Bayashi blog page. In May, I was invited to teach Edo Bayashi to a newly formed group in Seattle called Dekoboko Taiko. None of their members were familiar with Edo Bayashi, but they showed a lot of interest before, during, and after this introductory workshop. I was shown some of the music they play and it was wonderful to see their energy and emphasis on playing the group’s original compositions. I look forward to seeing the development of Edo Bayashi in Seattle. Thank you to Lamond and Leanna for the fun time. In August, Maui’s dynamic youth group Zenshin Daiko invited me for a one-week residency. It’s always wonderful to be back in Hawaii and to work with such a great group of kids. Zenshin has a lot of experience performing big shows and learning from professionals, and as a result I have learned that it usually take them half the time to learn new music compared to other taiko groups. This proved to be true when I introduced the taiko and atarigane patterns for Nageai, where they were able to rotate parts to learn everything in the book. I returned in October to introduce the fue parts along with new taiko and atarigane variations to incorporate. I look forward to seeing how this group incorporates the new material into their future performances. Thank you to Tony and Valerie Jones for the always wonderful hospitality. In September, I traveled to Denver for a variety of workshop topics. The origin point of the tour was the Denver Buddhist Temple, where I conducted a Natto Demonstration and a Japanese Knife Sharpening Workshop. Those events went well, along with the music-related workshops for different Denver groups. There was a public workshop called Introduction to Edo Bayashi where we covered the taiko and atarigane parts for Nageai. A few days later was the class where we covered the fue portion. I feel fortunate to have a lot of friends who take care of me in Denver, and I feel warmly welcomed each time I visit there. Thank you to Sarah Anderson, Courtney Ozaki, and everyone else involved with my tour. Finally, back to the new taiko fund-raised and ordered by TaikoArts Midwest! The beautiful new instruments arrived to Minneapolis in early November and I was invited back to introduce more Level 2 Edo Bayashi material from my June intensive. It was also rewarding to share the new shimedaiko tightening method to everyone, and this was the first tightening session since their delivery. The drums look incredible and sound fantastic! 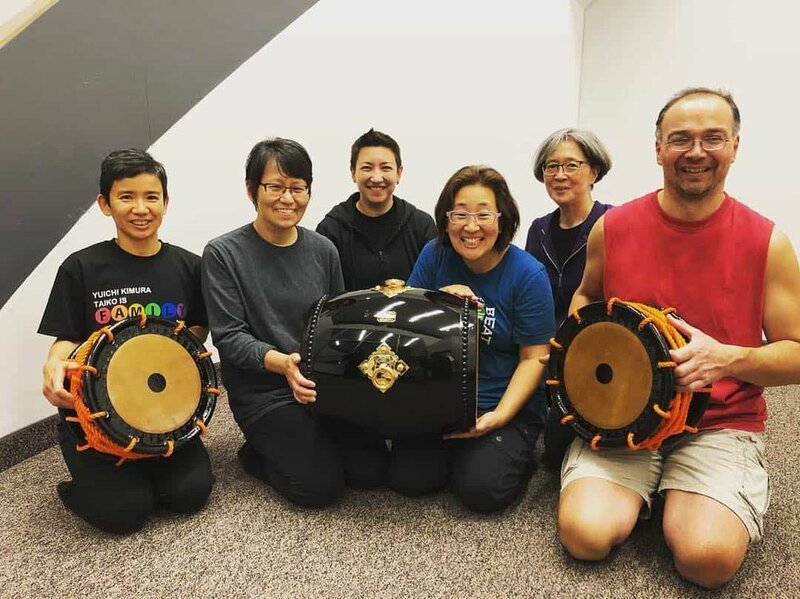 The real sound can only come from the real instruments made for this specific music, and it was wonderfully rewarding to conduct our workshops on these new drums after tightening them as a group using Suzuki sensei’s method. Indisputably, TaikoArts Midwest is simultaneously setting the bar higher for Edo Bayashi study and showing the rest of us that this is all possible. I am looking forward to what comes next in Minnesota, and everyone should be paying close attention as well. Thank you to Iris Shiraishi and Jennifer Weir for everything you do.